The acquisition gives Ant Financial a massive international boost, and for the first time a significant profile in Europe where does have a modest presence, but it comes amid some stumbles for the company in its other attempts to expand internationally. China represents a significant investment opportunity for breakthrough innovations in digital industries. Data from late 2017 suggests that increased digitization may lead to a shift of 10 to 45 percent of industry revenue pools in China by 2030. This shift has particular implications for key sectors like consumer and retail, automotive and mobility, health care, and freight and logistics. China, which already has one of the world’s most globally competitive economies, may experience explosive economic boosts from emerging digital innovations. For example, China currently accounts for 42 percent of the global e-commerce market. 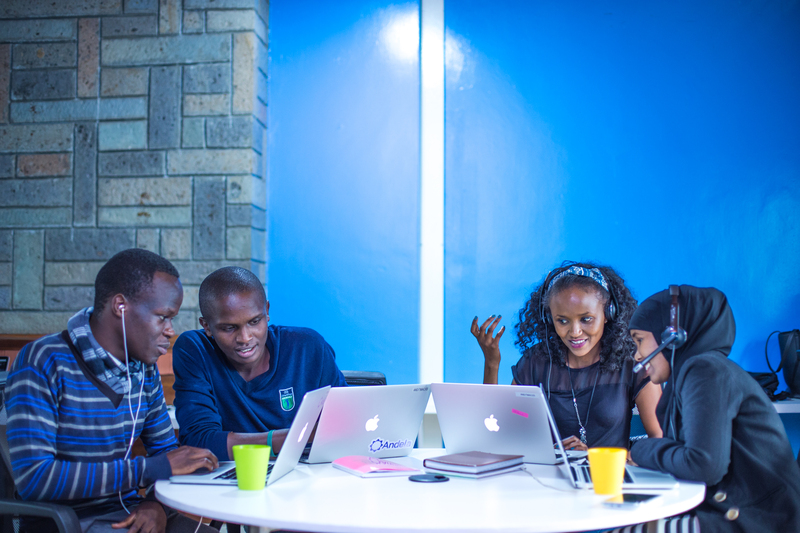 The country is also home to one-third of the world’s most successful tech startups. Investors who back such ventures may reap benefits in the long-term. Below are three industries in which China is currently displaying dominance. In 2017, the International Federation of Robotics reported China to be the strongest marketplace in the world for the robotics industry. The group found that China boasts the most operational industrial robots on the planet. That total number is predicted to be around 950,300 units by 2020. Industrial robotics systems are considered foundational to the rise of “smart factories,” which may further cement China’s status as a global Mecca for manufacturing. On a smaller scale, robots are becoming common sights in public spaces in China including on streets — fully robotic parking garages, for instance — and even in dining establishments. Alibaba recently deployed a futuristic restaurant concept, Robot.He dinners, with robot waiters in place of human servers. The emerging field of artificial intelligence (AI) nicely complements innovations happening in the robotics arena. Today, some of China’s most prominent technology companies are investing heavily in R&D for AI. Three of China’s major tech companies — Baidu, Alibaba, and Tencent (BAT) — have announced huge and ongoing commitments to AI innovation. Some of the most impressive advancements are occurring in the promising field of deep learning. Major international players are also turning their attention to China for further development of AI. In late 2017, for instance, Google announced plans to open an AI center in Beijing. Two of the foundational technologies behind advanced AI include image and voice-recognition software. According to the Ministry of Industry and Information Technology, China is now competitive with other global leaders in voice- and image-recognition technologies. These systems increasingly underpin platforms such as ride-sharing apps, security systems, and “social credit” schemes. AI holds promise for the Chinese economy as a whole. McKinsey data estimates that AI technology stemming from China could add up to 1.4 percentage points to the country’s annual GDP growth. In addition to an impressive mobile payments market, China is making major advancements in automation. In the autonomous vehicle space, China is spearheading projects such as Baidu’s fleet of 100 automated buses in Beijing and Shenzhen. These self-driving buses are set to hit international streets in Japan as soon as early 2019. Chinese company Tencent is also reportedly experimenting with self-driving consumer cars in overseas markets such as Silicon Valley. Part of the reason the autonomous vehicle industry is flourishing in China is that its citizens are prone to early adoption: One survey found that 60 percent of Chinese respondents would be willing to switch car manufacturers for improved connectivity features. That number in Germany, by contrast, was just 20 percent. It’s not just the transportation industry that will see digital revolution due to automation. Cargo and package delivery — and by association, the e-commerce industry at large — is seeing an uptick in automation technologies. Drone delivery has already received go-ahead for testing from the Chinese government in rural areas of the country. Companies seeking to capitalize on automation tech may take a page out of the book of successful drone companies like DJI. DJI, a Shenzhen-based startup known for its popular consumer drones like the Phantom and the Mavic series, today controls close to 75 percent of the consumer drone market. In March of 2018, DJI was reportedly valued at close to $15 billion, nearly double its valuation from just three years ago. With impressive advancements in robotics, AI, and automation on the horizon, China is proving a global force for innovation — and an increasingly attractive market for investors. As we look back, this prediction proved to be true. The market cap of the Matrix FinTech Index grew 50 percentage points in 2018, far outpacing the incumbent financial service giants and the S&P 500. 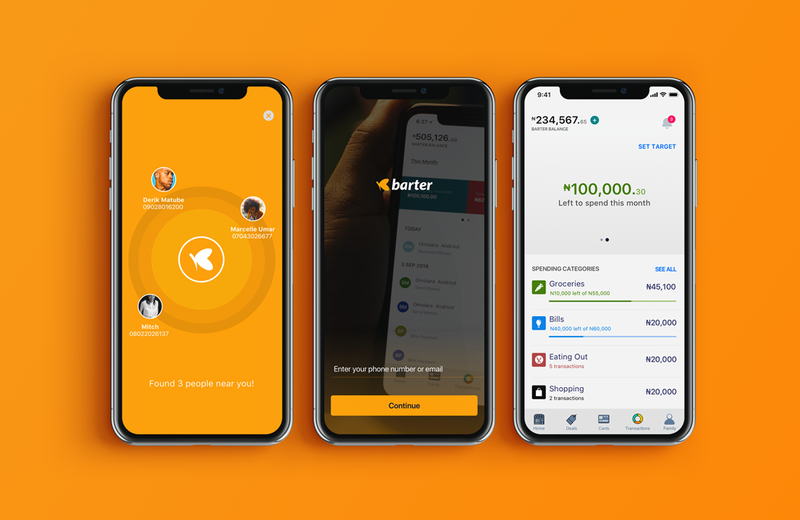 Looking ahead to 2019, we predict that the fintechs will continue to steal the show — creating innovative tech-enabled products, providing access to underserved demographics and putting consumers first. In this 2018 year-end edition of the Matrix FinTech Index, we are excited to provide a refreshed view of last year’s index. As a quick reminder, the index is a market-cap weighted index that tracks the progress of a portfolio of 10 leading public fintech companies. 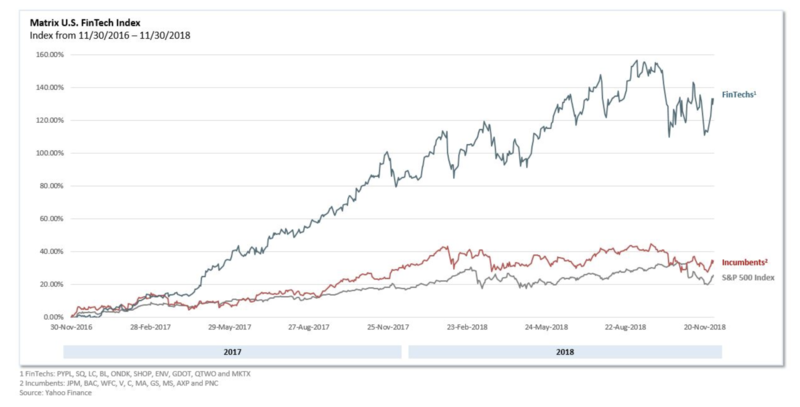 For comparison, we also included another portfolio of 10 large financial services incumbents (companies like JP Morgan and Visa), as well as the S&P 500. In 2018, the total market cap of the top 10 publicly traded U.S. fintechs grew to nearly $170 billion and the two-year returns of the fintechs are now at 133 percent — 100 percentage points higher than the two-year returns for the incumbents. Definition: Matrix Partners considers “fintechs” to be venture-backed organizations that are (a) technology-first companies that leverage software to compete with traditional financial services institutions (e.g. banks, credit card networks, insurers, etc.) in the delivery of traditional financial services (e.g. lending, payments, investing, etc.) or (b) software tools that better enable traditional finance functions (e.g. accounting, point-of-sales systems, etc.). Compared to 2017, volatility increased in 2018. While part of this is the broader state of the equity markets in 2018, it’s worth noting a few specific headwinds (e.g. 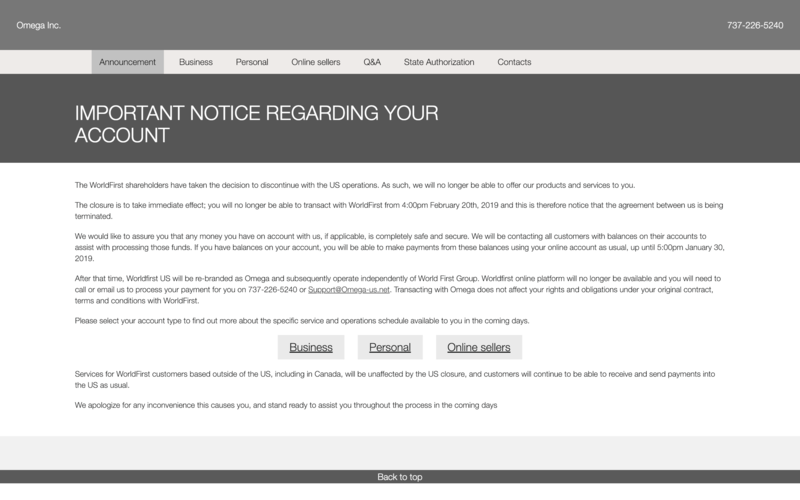 the TIO security breach that impacted PayPal, Amazon launching Amazon Pay), as well as a few general macro concerns like rising interest rates. But looking ahead to 2019, all 10 of the publicly traded fintechs are expected to continue to have double-digit growth. The only incumbents expected to squeak into double-digit territory in 2019 are card issuers like Visa (11 percent) and Mastercard (13 percent) — enabled, in part, by the growth of fintech payment companies like Square and PayPal. 2019 Prediction: The Matrix FinTech Index will deliver 200 percent returns over the three years ending in December of 2019, outperforming the incumbents and S&P 500 by at least 150 percentage points. While the FinTech Index performed well on the public markets in 2018, we also saw some very promising liquidity events for privately held companies. In 2017, there were only three fintech exits in the U.S. over $100 million, totaling just over $700 million in value. In 2018, that number grew by a factor of 10 to over $7 billion in value. More than half of that value came from the GreenSky IPO, but there were also a number of significant M&A events. We expect M&A activity to increase as financial services incumbents acquire fintech companies in an effort to stay competitive. 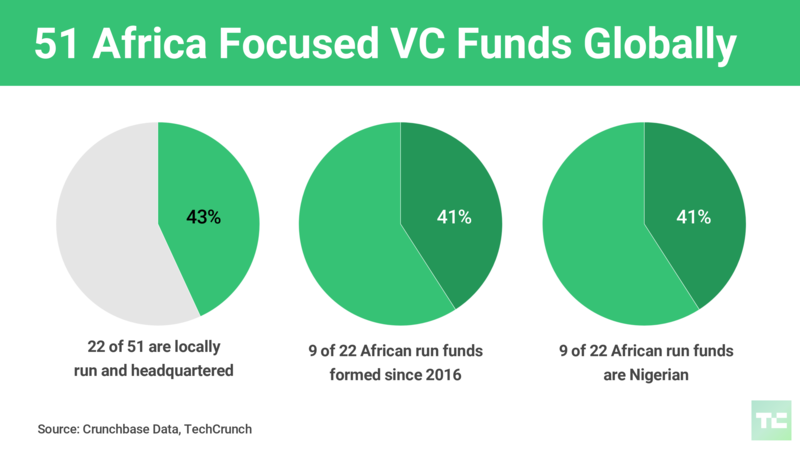 And we continue to believe that the fintech sector will prove to be one of the most fruitful sectors for venture returns in the 15 years following the 2008 financial crisis. 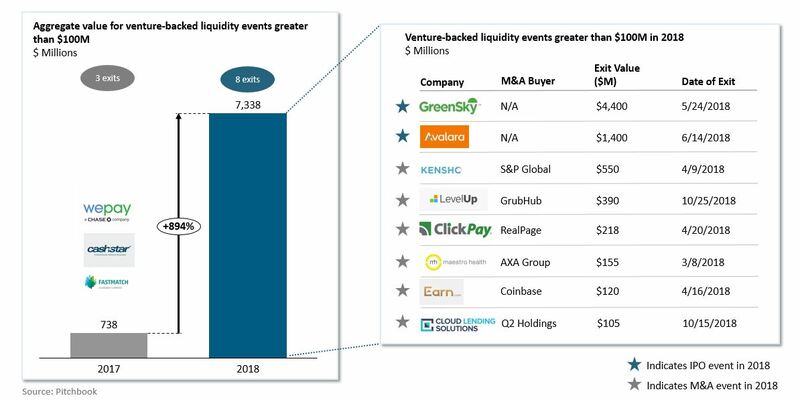 2019 Prediction: Total aggregate value for fintech liquidity events will exceed $10 billion in one year for the first time ever. What’s even more exciting than 2018’s liquidity is the backlog of privately held fintechs, led by Stripe, that are valued at over $1 billion. There are now 20 fintech unicorns. In fact, there are more fintech unicorns than any other industry vertical in the Unicorn Club. More than 50 percent of these raised big growth rounds in 2018 and five of them (Circle, Plaid, Brex, Root and LendingHome) made their debut on the U.S. fintech unicorn list for the first time. The expansion of this list shows there is no shortage of high-potential areas to disrupt in financial services. 2019 Prediction: Total aggregate value for fintech unicorns will cross $90 billion and the total number of fintech unicorns will begin to close in on 30. Despite these successes on the public markets, in liquidity events and among the unicorn ranks, we are still in the very early innings of the fintech revolution. 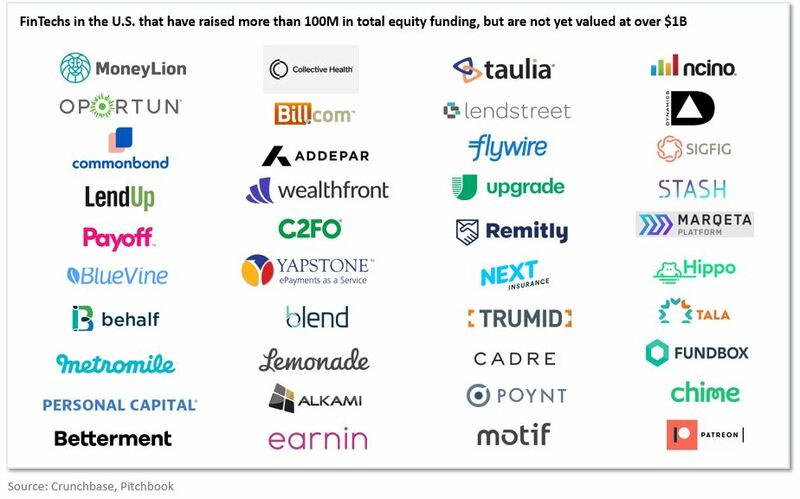 2019 will be even more impressive than 2018 as there are an additional 40 U.S. fintechs that have raised more than $100 million in equity funding and are on the brink of entering the unicorn club. As many of these companies make that transition, they will sprout another wave of more interesting fintech companies as early employees go on to start their own companies in a virtuous wave of value creation. We expect these newcomers, and others aspiring to follow in their footsteps, will threaten to end the rule of the financial establishment. They will continue to offer better financial products to consumers, empower more efficient payment channels and create a more open financial system. At the same time, the incumbents will continue to struggle with innovation, hamstrung by their scale, regulatory burdens and decades of accumulated technical debt.